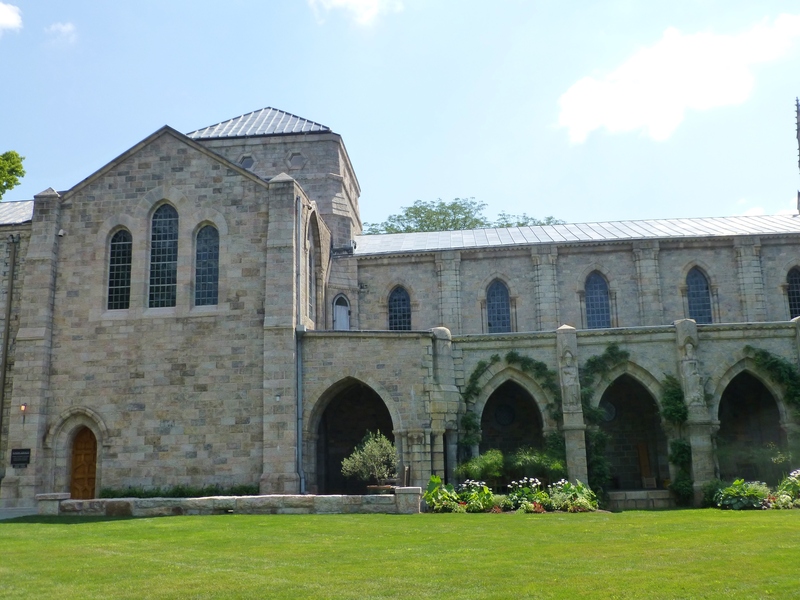 Last week I took some much-needed ‘ME’ time and allowed myself a quiet stroll, all by myself with my camera, through the Bryn Athyn Historic District. 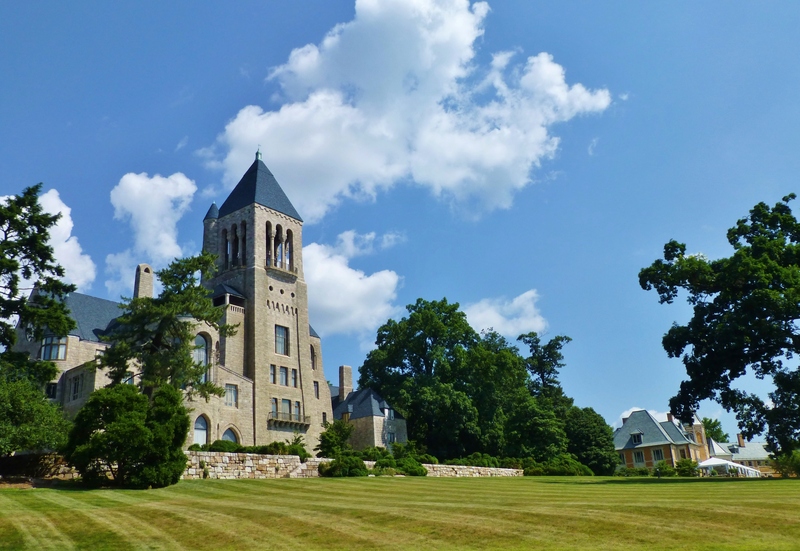 Three absolutely beautiful structures (the Bryn Athyn Cathedral, the Glencairn mansion, and the Cairnwood mansion) were designated as part of a National Historic Landmark on October 6, 2008. Glencairn, the stone mansion seen at the left, and Cairnwood, the yellow mansion at the right, were the home to Raymond and John Pitcairn respectively. The son and his father were billionaires whose fortune was derived from control of the Pittsburgh Plate Glass Company. I’ll devote another post to these two lovely homes and their gardens in the near future. Industrialist, John Pitcairn (1841-1916) provided funding for the projects, and his son Raymond (1885-1966) oversaw the design and construction of this unique Gothic and Romanesque style complex. 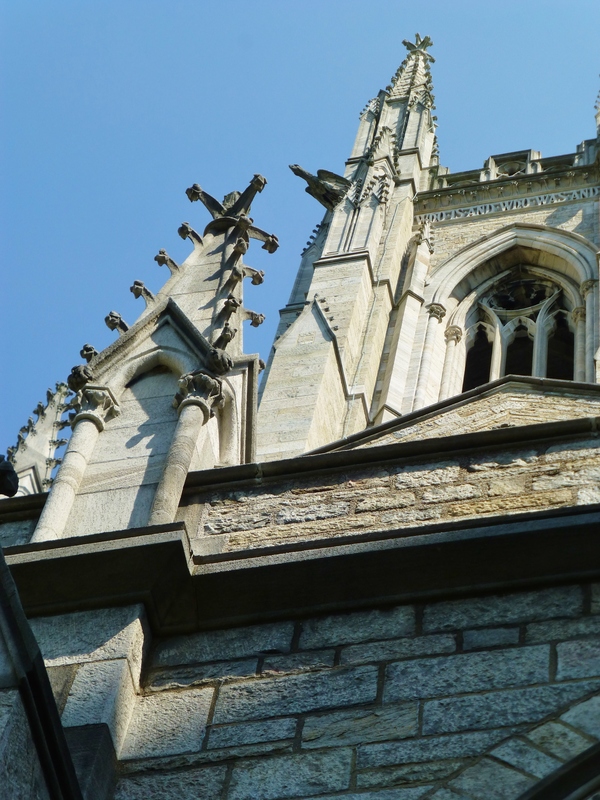 Today I want to share some inspiring photographs I took of the unbelievably stunning Bryn Athyn Cathedral. 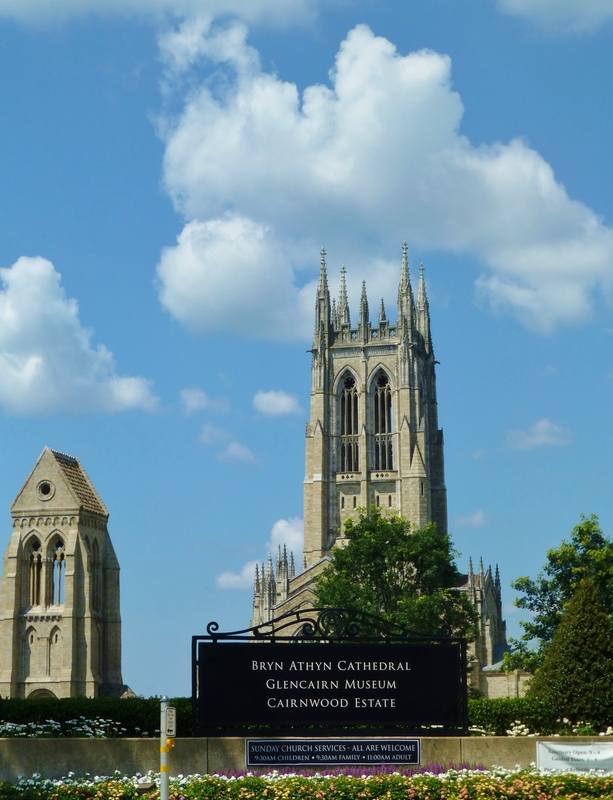 The main entrance to the cathedral is found on Huntingdon Pike in Bryn Athyn, Pennsylvania. I took this photo while sitting in my car at the stop light. 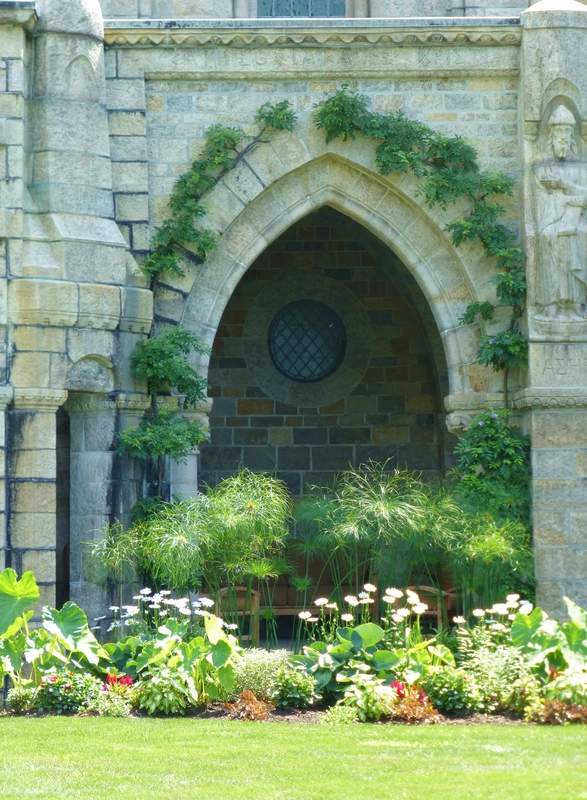 This stone is positioned amongst lovely plantings at the entrance to the Bryn Athyn Cathedral. 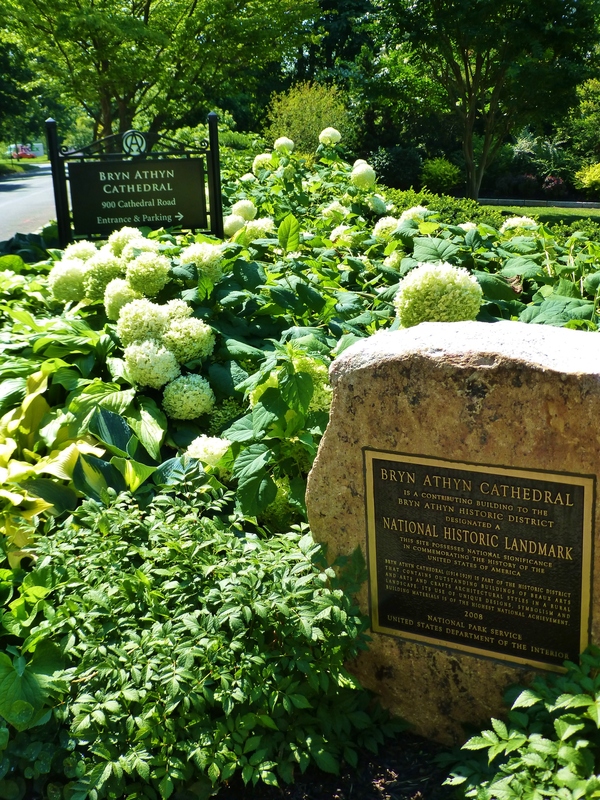 The bronze plaque commemorates the prestigious National Historic Site designation. 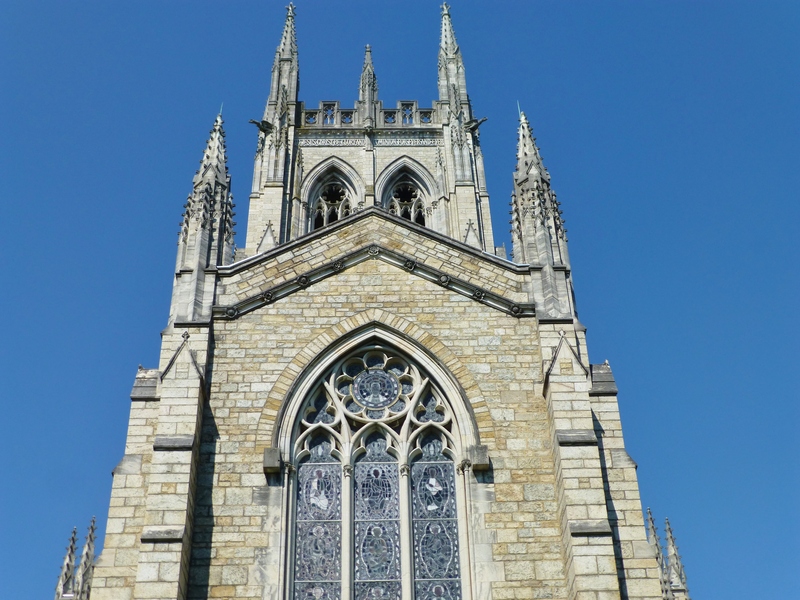 According to the Bryn Athyn Church’s website, the main construction of the Cathedral took place between the years 1913 and 1928 with work on the stained glass windows and interior decoration continuing into the early 1940s and beyond. 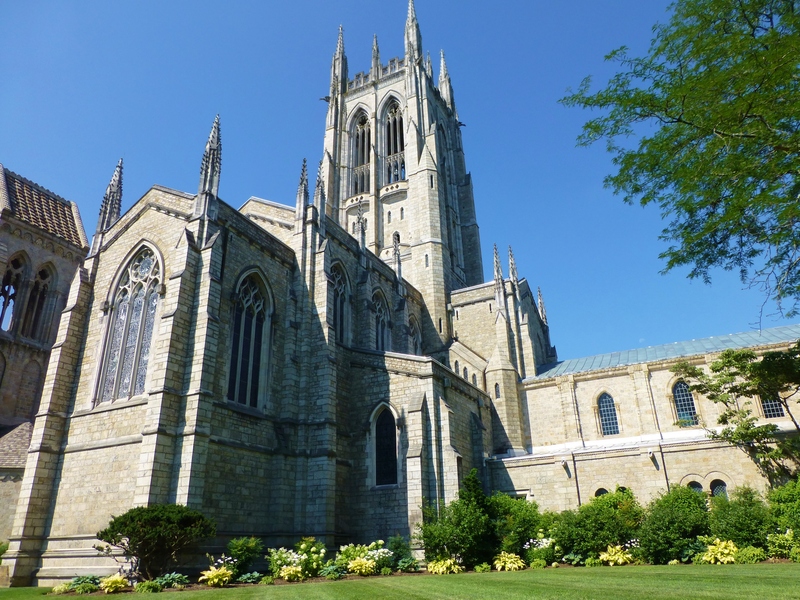 The main Cathedral building is Gothic, while the northern and southern buildings are in the early Romanesque style. The Gothic architecture is absolutely stunning. 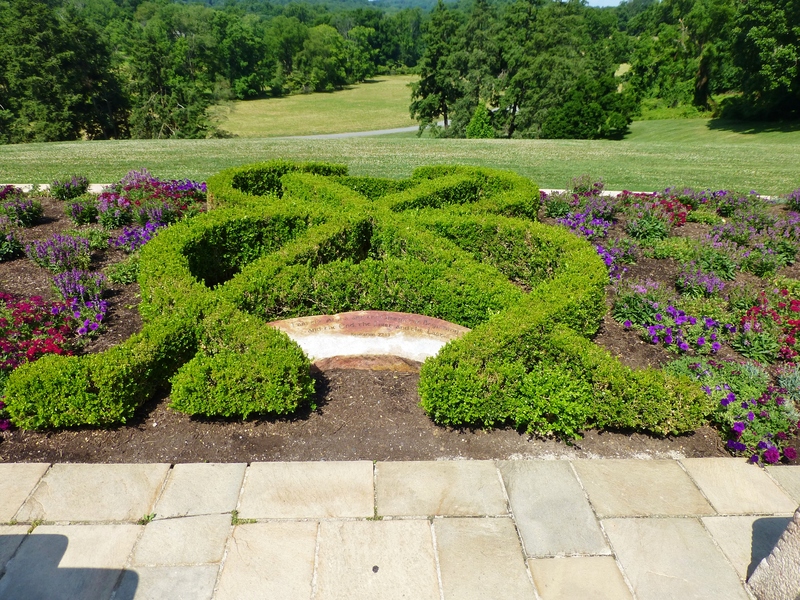 I was so inspired as I strolled the grounds on a beautiful July morning. The gardens surrounding the cathedral are magnificent! 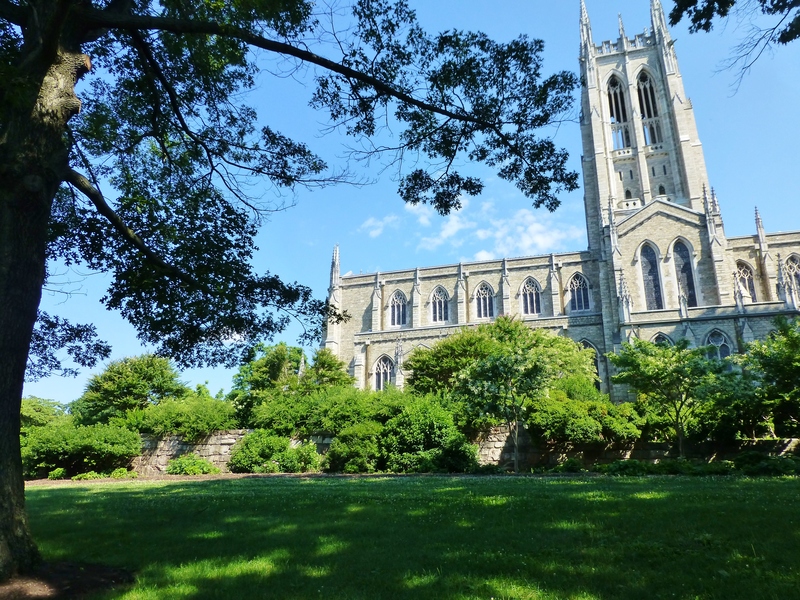 The beautiful and expansive grounds of the Bryn Athyn Cathedral are enjoyed by both church members and by many visitors from the extended community. 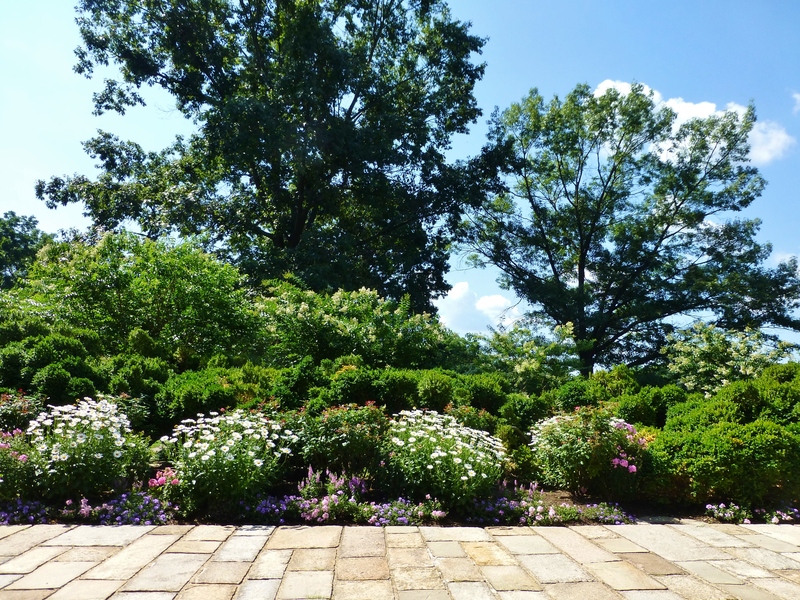 The master landscaping plan for the grounds strives to combine the spiritual correspondences of the building and the landscape into one comprehensive whole. 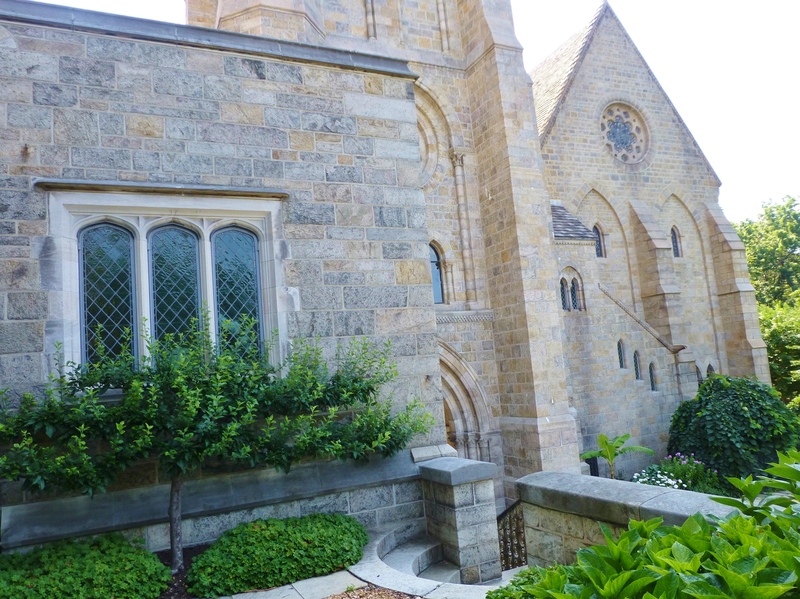 According to the Bryn Athyn Church website, the primary purpose of the grounds surrounding the Cathedral is to support the activities and needs of the Bryn Athyn Church congregation and demonstrate their doctrine in a living way, while maintaining the Cathedral as the symbolic center of the New Church. Providing a beautiful environment is important in creating an inspirational atmosphere for those who worship here. Around every corner is another stunning view, combined with lush landscapes. I took this photograph from a shady spot just downhill from the cathedral. 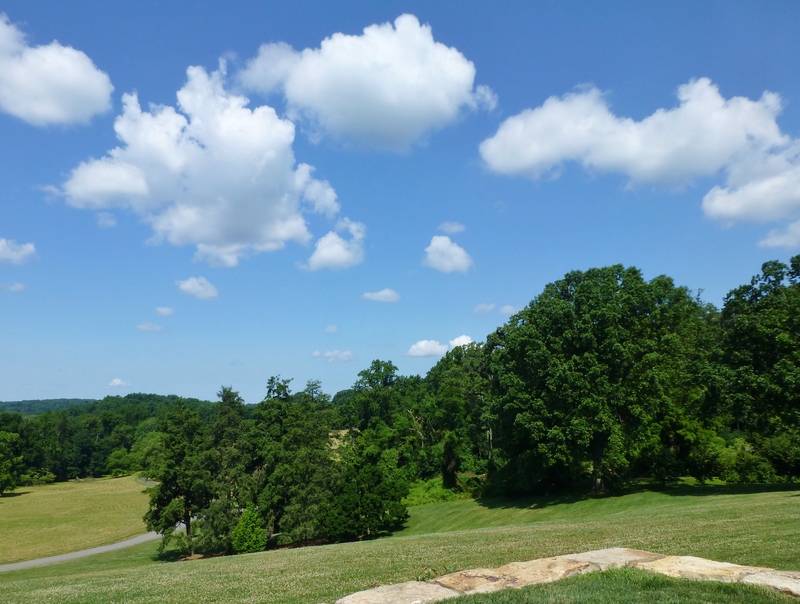 The sky was such an incredible blue and the lush green landscape was mesmerizing! Here is a detail of just some of the handcrafted windows set in stone. Notice the one embellished pillar. So elegant and inspiring! 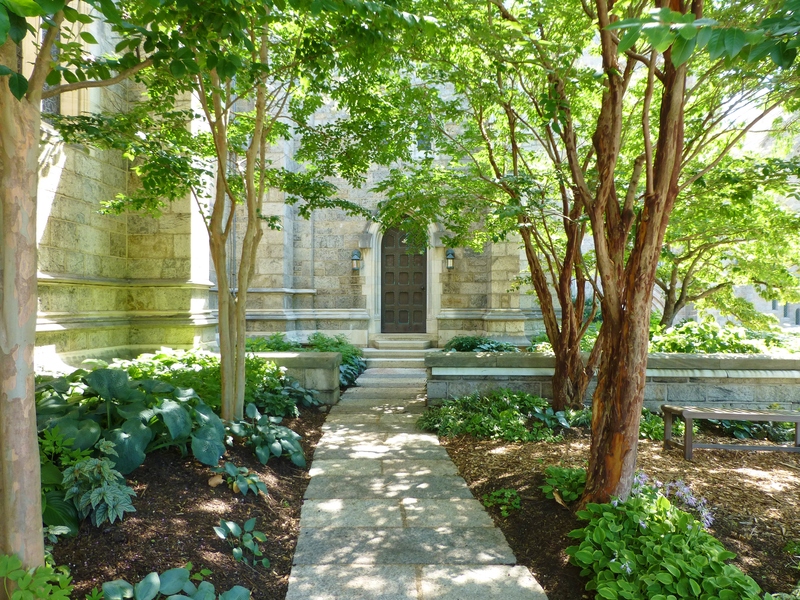 I thoroughly enjoyed finding little nooks and crannies, like this quiet shady path into a corner which is home to the Bishop’s private entrance. This espaliered tree was just gorgeous, trained along the windowsill above a lovely balcony. You may notice the Romanesque part of the cathedral can be seen on the far right. 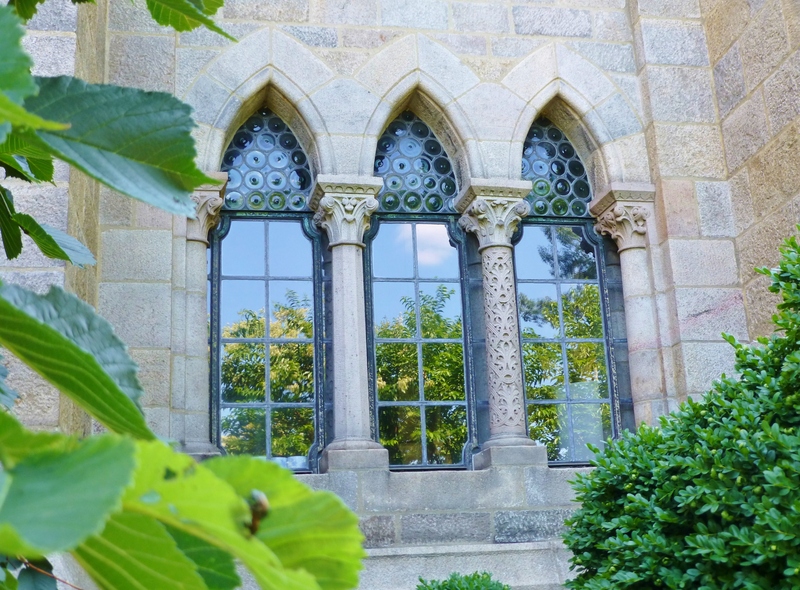 This image shows the detail work in the Gothic-style stone carving, including the biblical words above the window, the crockets (hook-shaped decorative elements common in Gothic architecture), the window tracery, and the downspout in the form of an Eagle. This image shows a peek into the quarry, which is still found just below the Cathedral. Much of the stone used in the construction of this magnificent structure was quarried locally and some was actually found on-site. How amazing is that? This side of the cathedral is particularly beautiful. It’s just so hard to believe that all this was built during the 20th century! A detail of the repeated arches and the carvings of biblical figures. Notice the stunning garden plantings here. 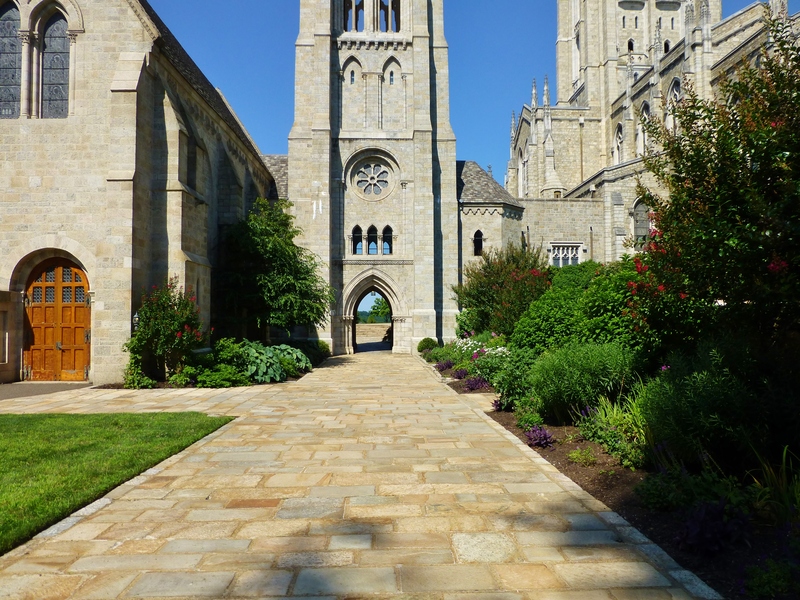 The front of the cathedral faces a verdant landscape which is spread out expansively before the viewer. What a treat to see unspoiled hills and scenery for such a distance! I took this photo just down the hill from the cathedral, looking up from a little-used road which leads to the church offices. 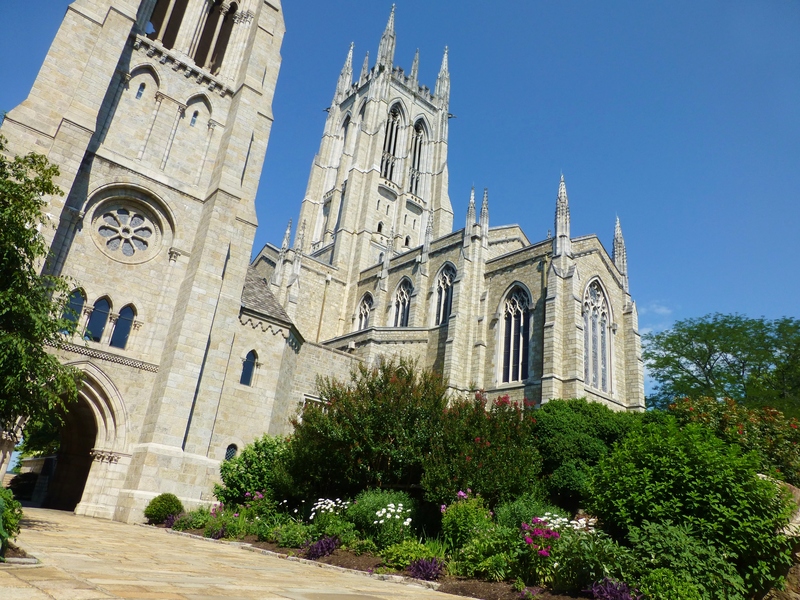 What a marvelous sight it is to see the cathedral atop the hill in all its glory! 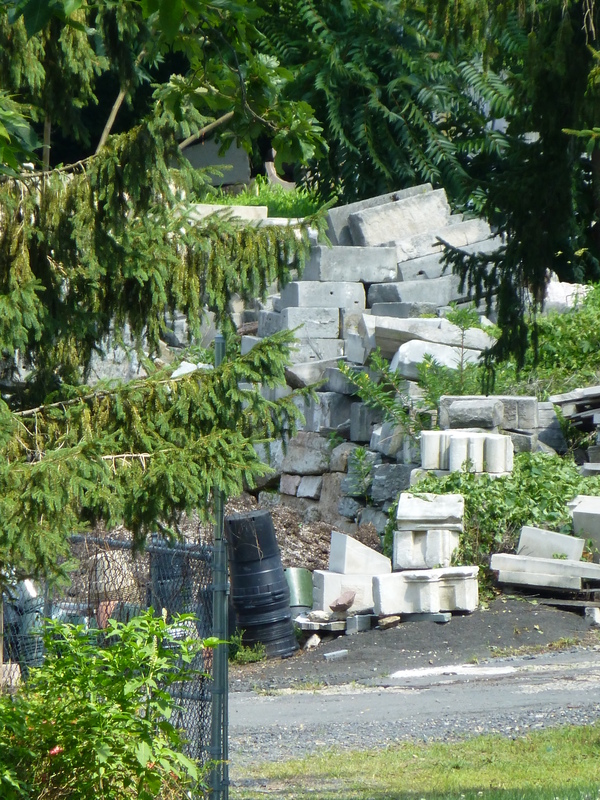 I hope you enjoyed coming along with me on my inspiring summer walk. I find little sojourns to architectural sites such as this a true inspiration for my interior design work. Whatever your faith, this jaw-dropping architecture and its exquisite craftsmanship are certainly a rare treat to behold! Until next time, I hope you’ll take the time to leave me some feedback in the comments section…I love to hear from you! And please tell everyone you know about Robinson Interiors–I need all the friends I can get! 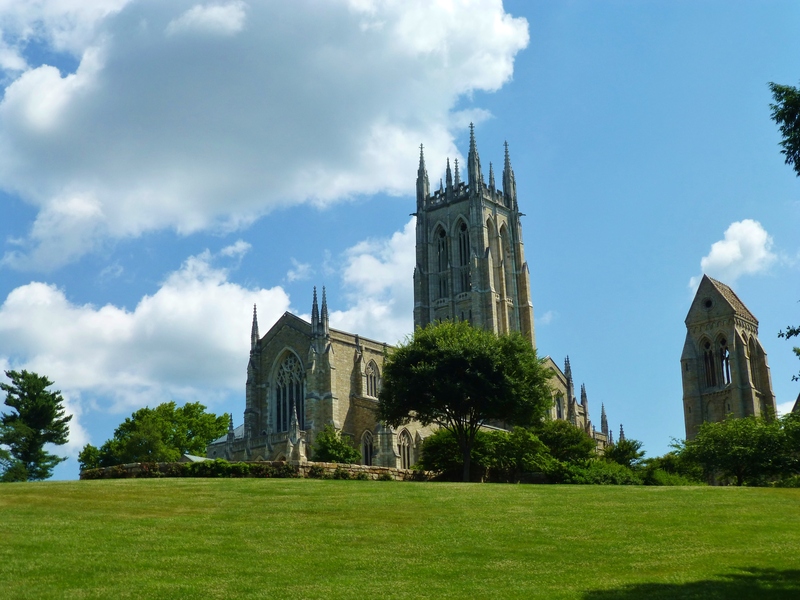 This entry was posted in Architecture, Bryn Athyn, Historic Sites, Landscape, Pennsylvania and tagged Cathedral, Church, Garden Design, Gothic, National Historic District, National Historic Site, Philadelphia, Pitcairn, Romanesque. Bookmark the permalink.